Vaishno Devi is one of the most prestigious destinations of Hindu Pilgrimage in India. Mata Vaishno Devi is an incarnation of all the supreme energies running the entire world. 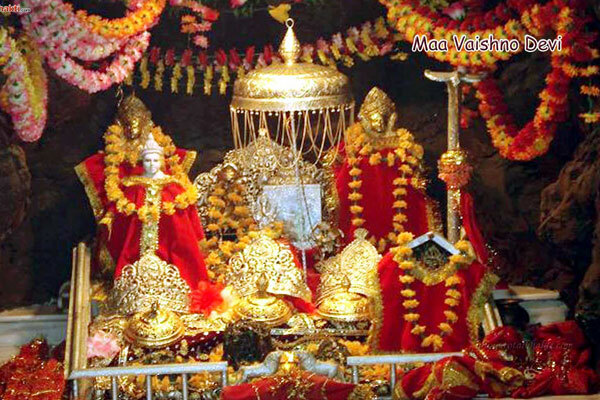 Inside the holy cave of maa vaishno devi, the Goddess occur in natural rock formation, known as "Pindis". Temple of maa Vaishno Devi is located in Katra, a small town of state of Jammu and Kashmir. Maa Vaishno Devi is believed to fulfill every wish of the devotee who visits the holy temple of Maa Vaishno Devi. The holy shrine of maa vaishnodevi is located in the Trikuta Hills of Katra. Katra is a well connected town by road and train to places all over India. The temple of Maa Vaishnodevi is at a distance of 14 km from Katra. One can reach the temple by availing various conventions such as Battery cars, Ponies, Paalkis and Helicopter service. The helicopter service is from Katra to Sanjichhat, after where the temple is at a distance of just 2.5 km. We render the best and affordable tour to Maa Vaishno devi. We provide you with all the arrangements in order to make your journey simple and fruitful. We deal in all kinds of services which includes hotel service, cab service. To further ease your journey we also provide Helicopter service booking to the holy shrine of maa vaishno devi . 43, VR Building, New Green Park Mkt.